Page Street Publishing, 9781624144196, 192pp. Create fantastic holiday fare with a twist fit for any celebration with Holiday Slow Cooker. Have more room for other dishes in or eliminate using your oven by having a slow cooker take on some of the elements. 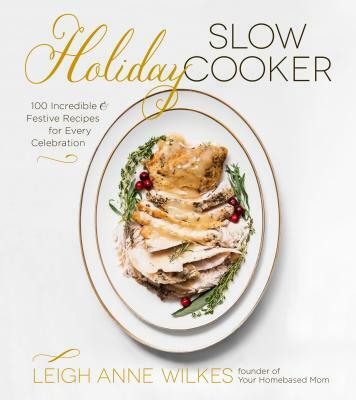 Leigh Anne Wilkes created 100 recipes that are extravagant and gourmet, yet easy to make for festivities. Make parties and entertaining less stressful on your oven by leaving your slow cooker in charge. Create feasts for summer holidays with the BBQ Brisket and Triple Berry Crisp; in the fall and winter, there’s Cornbread and Sausage Dressing and Herbed Turkey Breast. Also included are recipes for Valentine’s Day Dinner, Chinese New Year, St. Patrick’s Day, Easter, Cinco de Mayo and even recipes for appetizers and breakfast. This book features 100 delicious recipes and 60 mouth-watering photos. Leigh Anne Wilkes is the founder of Your Homebased Mom. She lives in Portland, OR.